Unionville High School Kacie Breeding leads her teammates to a team win in the McQuade Invitational, this past weekend, where the Indians bested what had been the top girls’ cross country team in the nation, Fayetville-Marlius. EAST MARLBOROUGH — There is a perfect storm brewing over in Unionville and the storm should break come November at the States for the girls cross country team. On Saturday there was a mini tornado that touched done when the girls traveled to upstate New York last Saturday for the McQuade invitational featuring the number one ranked team in the nation, Fayetville-Marlius. 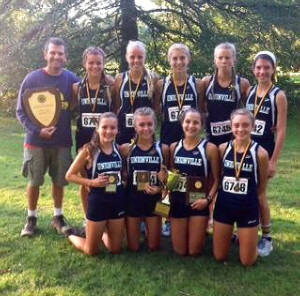 The Unionville High School varsity girls cross country team prevailed in the seeded 3-mile race and won the team competition by averaging 17:32 for the top five girls over the 3-mile course. Courtney Smith (senior) was the individual winner with a hare-footed race time of 16:46.2, good for a swift 5:46 average mile time. Scoring for the Indians were also Olivia Young (junior) who placed 7th, Emily Fisher (senior), 8th, sophomore and freshmen phenoms Kacie Breeding and Elizabeth Edwards in 15th and 16th respectively. Two 11th graders Courtney Zerbe and Molly Wentz placed 26 and 27th overall. I had the opportunity to ask Coach Mark Lacianca via email how he is feeling about these top echelon girls and how his boys are coming along — not surprisingly he was excited about the state of his program. The Unionville High School girls’ cross country team poses after winning the overall title this past weekend at the McQuade invitational in New York State. As good as Unionville’s program has been, Lacianca said he thinks it is moving to an even higher level in 2013. Yesterday while watching the JV football team perform over at Unionville (a victory-16-8) I had the opportunity to watch the boys and girls training around the fields and track. The team camaraderie is hard to miss, and the efforts they put into their workouts is impressive. I could not help myself to think once again what a fantastic sport running is and how you get out of it what you put into it. Unionville is lucky to have a great coach and team leaders. The bonds these kids are creating will never leave them. For more results and recaps of the event Saturday go to Pennxc.com. On Friday, Oct. 13 Unionville will host the Ches Mont Championships races during the day. Come out and support Unionville cross country. Congratulations to all UHS runners!!! Way to go!! Probably one of the truest things I have ever had the pleasure to read.